The pharmaceutical industry presents all its new products and trends within the largest pharmaceutical product trade fair in Europe, EXPOPHARM. The German city of Düsseldorf has been the location of this event, attended by the largest manufacturers in the sector. 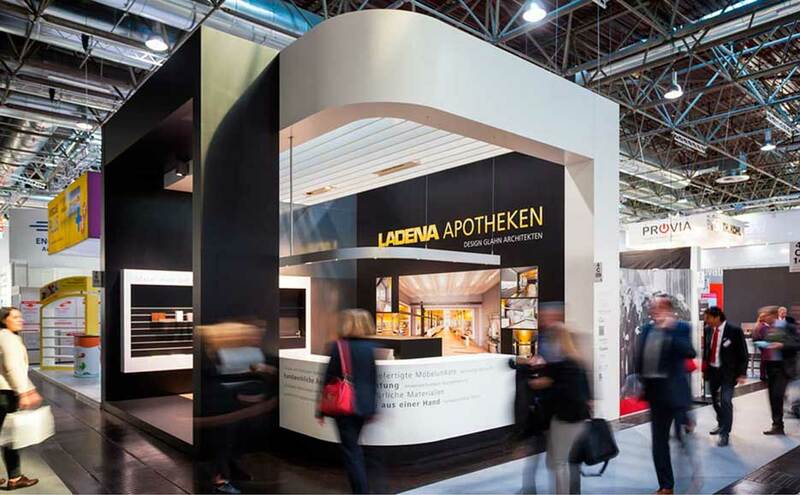 PORCELANOSA Group was present with KRION® Solid Surface, thanks to the Glahn Architeckten studio, which designed the Ladena Ladenbau stand, in which the 1100 Snow White version of our compact mineral was used. Glahn Architeckten, connoisseurs of KRION®, chose our material for the characteristics which make it ideal in the health sector. Due to its antibacterial properties and its additive-free composition, it is a recommended material in places where very high standards of hygiene must be maintained.